3-Dulcie Victoria Beatrice Appleby was born on 2 Sep 1891 in Ulverstone, Tasmania and died on 30 Dec 1932 in Ulverstone, Tasmania at age 41. Dulcie married Phillip Williams, son of Philip Edward Williams and Mary Ann Chatwyn, on 10 Nov 1909 in Abbotsham, Tasmania. Phillip was born on 8 Aug 1885 in Ulverstone, Tasmania and died on 27 Jun 1970 at age 84. With all her sisters being good cooks and dressmakers it was no trouble to organise her wedding. She married Philip Williams on 10th November, 1909 at Abbotsham. Philip being the brother of Daisy, who married Leonard Appleby. After they were married they went to live at North Motton and then to Natone where the 1915 bushfires raged. In one fell swoop everything, houses, dairies, stables, fences, stacks, vehicles, implements, etc., belonging to Messrs. F. Hays, Adama Aitken, F. E. Wright and T. Lynch were destroyed, while the house only of Mr. Phillip Williams was saved, all the outbuildings being burnt down. "It got here about 12.30 p.m., we battled hard, and were parched and scorched in our efforts to try to save the barn, but the flames beat us, and exhausted, we had to watch it reduced to ashes. Quickly the other outbuildings followed and then the house. We had battled so hard at the barn and other buildings that we were scarcely fit for anything; but if we had had water I think we could have saved out home. So dense was the smoke and so terrible the heat, that we had to lie flat on the ground. The children were carried onto some ploughed ground and buried in wet blankets, the flames leaping over the top of them. Fortunately, we got over to Mrs. Groom's. Her house was saved only by reason of the fact that there was plenty of water. As it was, the barn and fences were swept clear. "Mr. Lynch lost everything, bullocks, cows, fowls, crops, vehicles and so forth. Of course, there is not a fence of any value, or a scrap of feed left on the place. The chimneys are standing; the dead stock may be seen everywhere. Mr. Hays shared a fate the same, in almost every particular. A sewing machine and a table were dragged out of the burning house. He lost no stock, but grass and fences shared the same as in all other instances. He was away at the time, not being able to reach home before the flames. His horse returned with the saddle on, and naturally Mrs. Hays and the children spent an anxious and most trying time." "It was pitiful", said Mrs. Groom, "to see the poor women struggling through the smoke and flames with babies and little children in their arms." And there is no doubt that she was right. Mr. Phil Williams (55), of Preolenna, dug 115 sacks of potatoes in eight and a half hours on the farm of Mr. Ira Morse, Preolenna yesterday. His claim for a record is disputed by Mr. Dan Berechree, of Flowerdale, who, years ago, dug 88 sacks in approximately nine hours. In those days the sacks were bigger, 11 to the ton, compared with 15 to the ton nowadays. Mr. Williams began digging yesterday at 9.00 a.m. in a 10-ton crop of certified Brownells, of which Mr. Morse has about eight acres. Telling of the feat last evening, Mr. Morse said that when Mr. Williams downed his fork at 5.30 p.m. he seemed fresh enough to dig another 50 sacks. Mr. Morse added that, although Mr. Williams had topped the 100-sack mark this year he considered his performance last year was much better. On that occasion he dug only 81 bags in the time, but he operated under much less favourable conditions. The paddock had been replanted the second year, and when the time came for moulding, it was found inadvisable because of a large number of self-sown potatoes. Consequently, it was only flathoed. In addition, turnips were planted with the potatoes and there was a quantity of fern. To dig 81 sacks under such conditions was a remarkable feat. Yesterday conditions were in Mr. Williams' favour, for the crop was clean and well moulded. Dulcie and Philip later moved to Preolenna where Phil worked hauling logs to a nearby sawmill. Dulcie passed away when only 41 years old and was buried at Ulverstone. Dulcie and Philip had 10 children, six boys and four girls. The last two were twins. 4-Ellen Victoria Jean Williams was born on 17 Jan 1912. Ellen married Alexander John Johnson. Alexander was born on 7 Sep 1911 and died on 6 May 1983 at age 71. They had two children: Mavis Peggy and Wayne Vincent. 5-Mavis Peggy Johnson was born on 20 Apr 1932. Mavis married Desmond Ruttle. Desmond was born on 10 Feb 1930. They had three children: Warren Thomas, Kaylene Ellen and Leonie Josephine. 6-Warren Thomas Ruttle was born on 27 Sep 1952. Warren married Judith Harvey. Judith was born on 15 Oct 1954. They had two children: Benjamin Desmond and Jasmine Valerie. 7-Benjamin Desmond Ruttle was born on 19 Dec 1975. 7-Jasmine Valerie Ruttle was born on 20 Oct 1977. 6-Kaylene Ellen Ruttle was born on 6 Sep 1955. Kaylene married Christopher Debnam. Christopher was born on 11 Feb 1954. They had two children: Hayden Kenneth and Roxanne Jean. 7-Hayden Kenneth Debnam was born on 15 Jan 1979. 7-Roxanne Jean Debnam was born on 15 Dec 1981. 6-Leonie Josephine Ruttle was born on 13 Apr 1969. 5-Wayne Vincent Johnson was born on 4 Nov 1948. Wayne married Christine McMeekin. Christine was born on 7 Aug 1949. They had two children: Natrice and Aaron. 6-Natrice Johnson was born on 28 Nov 1972. 6-Aaron Johnson was born on 17 May 1978. 4-Alfred Owen Williams was born on 9 Mar 1913 in Natone. Alfred married Elizabeth Amelia Keen. Elizabeth was born on 9 Apr 1913. They had three children: Patrice Mary, Ronald Alfred and Philip Malcolm. 5-Patrice Mary Williams was born on 14 Dec 1937 and died on 29 Jun 1985 at age 47. Patrice married Graham Bell. Graham was born about 1935. They had one daughter: Lindy. 6-Lindy Bell was born on 27 Apr 1960. Lindy married John Smith. John was born about 1958. They had one son: Dwayne Godfrey. 7-Dwayne Godfrey Smith was born on 16 Dec 1983. 5-Ronald Alfred Williams was born on 22 Feb 1940. Ronald married Dawn Margaret Burgess. Dawn was born on 7 Jun 1944. They had two children: Karen Michelle and Brett Ronald. 6-Karen Michelle Williams was born on 5 Mar 1967. 6-Brett Ronald Williams was born on 18 May 1970. 5-Philip Malcolm Williams was born on 1 Mar 1944. Philip married Nola Ella Walsh. Nola was born on 9 Apr 1942. They had three children: Natrice, Troy Philip and Travis Malcolm. 6-Natrice Williams was born on 25 Jun 1968. 6-Troy Philip Williams was born on 21 Jul 1969. 6-Travis Malcolm Williams was born on 2 Apr 1976. 4-Edna Williams was born on 26 Jun 1915 in Ulverstone, Tasmania. Edna married William Henry Rogers. William was born on 9 Sep 1909 and died in 1950 at age 41. They had one daughter: Margaret Joyce. 5-Margaret Joyce Rogers was born on 20 Apr 1942. Margaret married Bevan Thompson. Bevan was born on 20 Mar 1940. They had two children: Tamara and Bradley. 6-Tamara Thompson was born on 13 Aug 1972. 6-Bradley Thompson was born on 24 Nov 1976. Edna next married Darrel John Lucas, son of Albert Charles James Lucas and Sarah Aylett. Darrel was born on 15 Dec 1912 in Queenstown, Tasmania and died on 16 Jul 1980 at age 67. They had one son: Trevor John. 5-Trevor John Lucas was born on 11 Feb 1955 and died on 4 Sep 1982 at age 27. 4-Leonard Edward Williams was born on 8 Aug 1917 in Mrs Treweeks, Mount Street, Burnie and died on 28 Nov 1972 at age 55. He served in the Second World War. Leonard married Flora Powe. Flora was born on 24 Sep 1915 and died on 28 Nov 1970 at age 55. 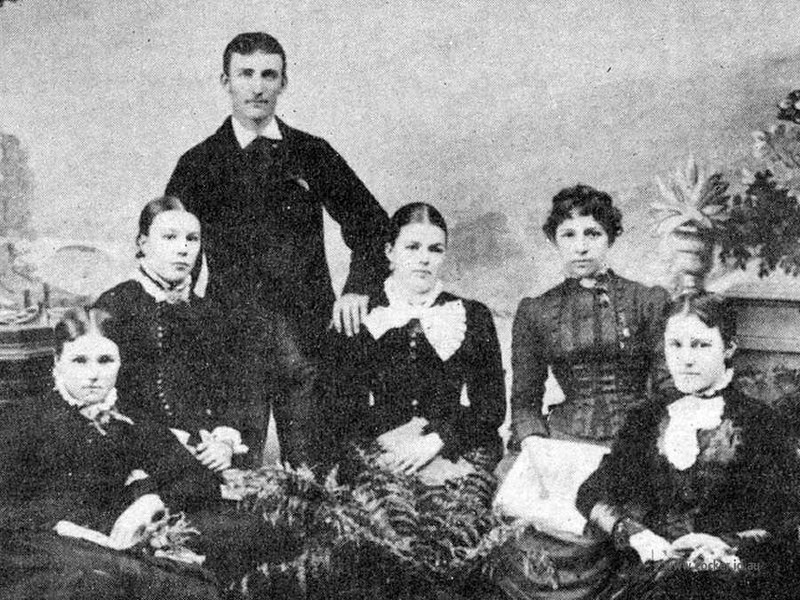 They had five children: Keitha, Dulcie Lorraine, Eric, Lenora and Aubrey. 5-Keitha Williams was born on 20 Apr 1937 and died on 19 May 1967 at age 30. Keitha married Harvey Mervyn Donovan. Harvey was born in 1935 and died in 1970 at age 35. They had three children: Malcolm John, Susan Elizabeth and Alison Margaret. 6-Malcolm John Donovan was born on 11 Apr 1959. Malcolm married Carmine June Hollick. Carmine was born on 31 Jan 1959. They had one daughter: Robyn Ruth. 7-Robyn Ruth Donovan was born on 12 Dec 1983. 6-Susan Elizabeth Donovan was born on 12 Mar 1960. Susan married Christopher Paul Shields. Christopher was born on 24 Jul 1956. They had three children: Jonathan Paul, Simon James and Kellianne Elizabeth. 7-Jonathan Paul Shields was born on 2 Jul 1980. 7-Simon James Shields was born on 5 Mar 1982. 7-Kellianne Elizabeth Shields was born on 8 Nov 1983. 6-Alison Margaret Donovan was born on 25 Apr 1961. Another name for Alison is Alison Donovan. Alison married Robert John Jones. Robert was born on 15 Oct 1958. They had three children: Nigel Robert, Stacey Nicole and Angela Louise. 7-Nigel Robert Jones was born on 5 Mar 1980 and died on 5 Mar 1980. 7-Stacey Nicole Jones was born on 6 Feb 1981. 7-Angela Louise Jones was born on 27 Feb 1982. 5-Dulcie Lorraine Williams was born on 2 Nov 1938. Dulcie married Eric Williams. Eric was born on 15 Dec 1933. They had five children: Philip Leslie, Dean Leonard, Merle Florence, Roger Eric and Bronwyn Lorraine. 6-Philip Leslie Williams was born on 15 Apr 1959. 6-Dean Leonard Williams was born on 24 Nov 1960. 6-Merle Florence Williams was born on 28 Jan 1962. Merle married Michael Sawford. Michael was born on 28 Nov 1960. They had one daughter: Rachel Theresa. 7-Rachel Theresa Sawford was born on 26 Sep 1982. 6-Roger Eric Williams was born on 8 Mar 1963. 6-Bronwyn Lorraine Williams was born on 14 Apr 1966. 5-Eric Williams was born on 8 Jan 1940 and died on 20 Oct 2008 in Royal Hobart Hospital at age 68. Eric married Carol Halls. Carol was born on 29 May 1941. 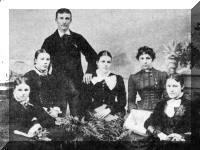 They had four children: David Leonard, Anne Maree, Natalie Joy and Margaret Kay. 6-David Leonard Williams was born on 10 Dec 1963. 6-Anne Maree Williams was born on 17 Sep 1965. Anne married John Thomas Alder. John was born on 21 Jan 1963. They had two children: Sarah-Jayne and Terri Anne. 7-Sarah-Jayne Alder was born on 22 May 1986. Sarah-Jayne married Darren James Pyke. Darren was born on 31 Aug 1984. They had three children: Eva Jayne, Jack Alder and Oscar James. 8-Eva Jayne Pyke was born on 7 Nov 2006. 8-Jack Alder Pyke was born on 25 Nov 2008. 8-Oscar James Pyke was born on 9 Apr 2011. 7-Terri Anne Alder was born on 15 Oct 1988. Terri married someone. He had one daughter: Ella-Grace. 8-Ella-Grace Alder was born on 18 May 2007. 6-Natalie Joy Williams was born on 16 Dec 1969. 6-Margaret Kay Williams was born on 15 Jan 1971. 5-Lenora Williams was born on 23 Feb 1942. Lenora married Michael Fisher. Michael was born on 13 Mar 1935. They had six children: Brett Andrew Lennard, Jason Edwin John, Michelle Carol Marie, Allan James, Helen Leanne and Lenora Carol Jayne. 6-Brett Andrew Lennard Fisher was born on 10 Apr 1963. 6-Jason Edwin John Fisher was born on 22 Nov 1964. 6-Michelle Carol Marie Fisher was born on 10 May 1966 in Ulverstone, Tasmania. Michelle married Neil Stanley Walker, son of Reginald James Walker and Iris Ellen Margaret Page, on 3 Jun 1989 in Ulverstone, Tasmania. Neil was born on 25 Jun 1956 in George Town, Tasmania. They had two children: Sebastian Paul and Alexander Neil Brett. 7-Sebastian Paul Walker was born on 5 Sep 1991. 7-Alexander Neil Brett Walker was born on 24 Oct 1995. 6-Allan James Fisher was born on 2 Jun 1968. 6-Helen Leanne Fisher was born on 2 Apr 1970. 6-Lenora Carol Jayne Fisher was born on 2 Jun 1971. Lenora next married Peter Edmunds. Peter was born about 1940. 5-Aubrey Williams was born on 20 Aug 1946. Aubrey married Janice Elizabeth Beames. Janice was born on 10 Nov 1949. They had three children: Craig Anthony, Jodie Maree and Emma Louise. 6-Craig Anthony Williams was born on 21 Jan 1972. 6-Jodie Maree Williams was born on 30 Nov 1974. 6-Emma Louise Williams was born about 1976. 4-Clifford George Williams was born on 12 Nov 1919 in Mrs Treweeks, Mount Street, Burnie and died on 22 Jan 1982 at age 62. He served in the Second World War. Clifford married Peggy Dawn Bellchambers. Peggy was born on 13 Apr 1927. They had four children: Philip Murray, Michael Laurence, Roger David and Brett Andrew. 5-Philip Murray Williams was born on 20 Aug 1948. Philip married Katrina Dada Adler. Katrina was born on 29 Sep 1955. 5-Michael Laurence Williams was born on 17 May 1950. Michael married Margaret Jean Cooper. Margaret was born on 14 Nov 1953. They had four children: Amanda Jane, Michelle Lee, Melissa Anne and Melinda Sue. 6-Amanda Jane Williams was born on 2 Jun 1974. 6-Michelle Lee Williams was born on 24 May 1977. 6-Melissa Anne Williams was born on 14 Nov 1979. 6-Melinda Sue Williams was born on 25 May 1981. 5-Roger David Williams was born on 2 Feb 1957. Roger4 married Tracey Summers. Tracey was born on 25 Jun 1964. Roger next married Helen Cooper. Helen was born on 26 Jun 1967. 5-Brett Andrew Williams was born on 27 Dec 1962. Brett married Angela Wright. Angela was born on 27 Mar 1966. They had one daughter: April Jade. 6-April Jade Williams was born on 7 Aug 1987. †4-Malcolm Williams was born on 25 Dec 1923, died on 25 Dec 1944 as Prisoner Of War in the Second World War at age 21. 4-Frances Williams was born on 4 Jul 1925. Another name for Frances is Peg. Frances married Bertram H. R. Hanks. Bertram was born on 14 Oct 1921. They had three children: Noleen, Maxeen Lesley and Adrian Malcolm. 5-Noleen Hanks was born on 19 Feb 1950. Noleen married Brian Stanley Whiles. Brian was born on 10 Dec 1945. They had three children: Natasha Dawn, Matthew James and Richard Henry. 6-Natasha Dawn Whiles was born on 23 Mar 1972. 6-Matthew James Whiles was born on 2 May 1974. 6-Richard Henry Whiles was born on 1 Sep 1976. 5-Maxeen Lesley Hanks was born on 23 Aug 1952. Maxeen married William Jojn Leake. William was born on 10 Oct 1949. They had two children: Helen Joanne and Alison Clare. 6-Helen Joanne Leake was born on 14 Jul 1977. 6-Alison Clare Leake was born on 22 Aug 1979. 5-Adrian Malcolm Hanks was born on 9 Apr 1957. Adrian married Jacquiline Lane. Jacquiline was born on 17 Dec 1961. They had two children: Christopher Richard and Timothy James. 6-Christopher Richard Hanks was born on 27 Aug 1982. 6-Timothy James Hanks was born on 5 Feb 1985. 4-Desmond Williams was born on 9 Aug 1926. Desmond married Marlene Rowlings, daughter of Leslie Jack Rowlings and Ada Amelia Cocker. They had five children: Michelle, Janine, Michael, Mark and Adam. 5-Michelle Williams. Michelle married Murry Bennett. They had three children: Melanie, Lauren and Joel. 5-Janine Williams. Janine married Pitt. They had two children: Nicole and Mathew. 5-Michael Williams. Michael married Louise Carrol. They had two children: Danielle and Georgina. 4-Joyce Appleby Williams was born on 2 Nov 1928. Joyce married Maurice Baden Pointon. Maurice was born on 25 May 1922. They had six children: Angela Beatrice, Karen Francis, Marlene Joy, Colleen Judith, Deanna Lee and Joanna Marie. 5-Angela Beatrice Pointon was born on 4 Nov 1954. Angela married Garry Maxwell. Garry was born about 1952. 5-Karen Francis Pointon was born on 25 Mar 1956. Karen married Grant Raymond Hoare. Grant was born on 25 Feb 1953. They had two children: Nathan Kelcey and Kent Raymond. 6-Nathan Kelcey Hoare was born on 8 Feb 1974. 6-Kent Raymond Hoare was born on 25 Feb 1983. 5-Marlene Joy Pointon was born on 14 Apr 1958. Marlene married Darrel Wagner. Darrel was born on 21 Feb 1958. They had one son: Stewart James. 6-Stewart James Wagner was born on 15 Feb 1982. 5-Colleen Judith Pointon was born on 2 Dec 1960. Colleen married Stephen Molross. Stephen was born about 1958. 5-Deanna Lee Pointon was born on 19 Aug 1963. 5-Joanna Marie Pointon was born on 15 Jan 1969. 4-Royce Appleby Williams was born on 2 Nov 1928. Royce married Esta Briggs. Esta was born on 8 Dec 1934. They had one daughter: Loreen. 5-Loreen Williams was born on 30 Nov 1951. Loreen married William Weetman. William was born on 9 Jun 1947.